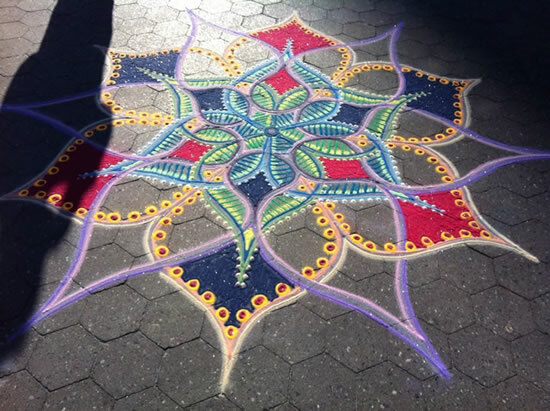 Colored sand, a great deal of patience and his bare hands are all Joe Mangrum needs to create his incredible sand pantings on the sidewalks of New York. 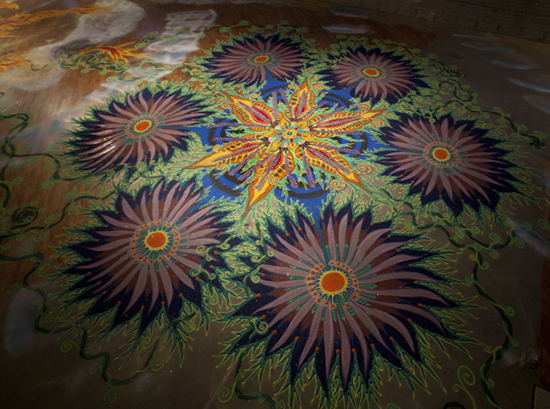 Joe Mangrum was a painter for many years, but only started creating art with sand in the Fall of 2009. He chose to work with sand because it’s an ephemeral medium that can simply be swept away at the the end of the day, after he’s had a chance to express his talent and amaze passers-by. I never thought sprinkling colored sand through the bottom of your fist could lead to such amazing works of art, but Mangrum’s creations prove patience and talent are the basis of truly incredible things. 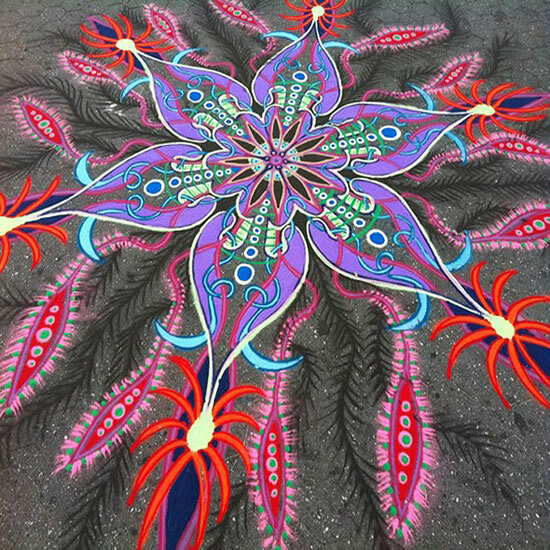 The gifted street artist spends hours on end on his hands and knees sprinkling his colored sand onto the sidewalk to create ephemeral masterpieces that catch the eye of everyone around him. 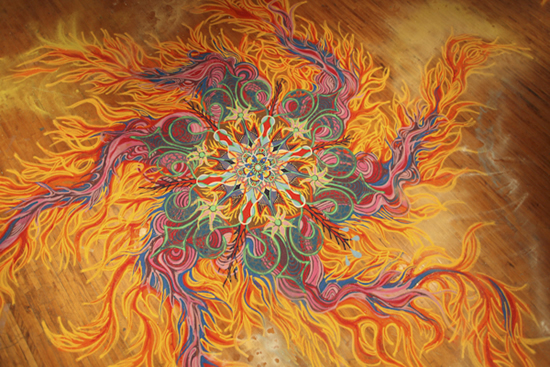 Perhaps the most amazing thing about Joe Mangrum’s sand paintings is that they are spontaneous creations influenced by his overall felling of the day, or by something someone around him says, and even by the environment surrounding him. Nothing is planned or sketched out beforehand, his works all have improvisational qualities. “People are inspired by it. Kids are inspired by it, elderly people, homeless people, investment bankers. I’m doing what I love”, Mangrum says about his art. The artist, who lives in Park Slope, says his art occasionally gets swept away by wind, but most times his art remains intact until he’s finished, and the viewers have a chance to see it whole. Everyone who gets the chance to see his beautiful mandala-like artworks are is in awe at the their incredible beauty and detail. Although Joe Mangrum has artworks for sale on his website, he mostly relies on donations from onlookers for income. 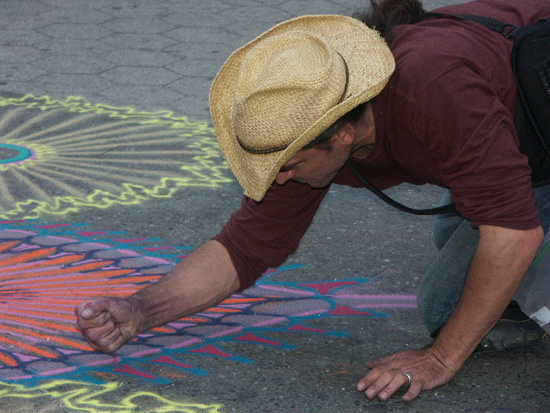 He knows sand painting on the sidewalks of New York won’t be enough to support him forever, but he knows it will always be a part of him. 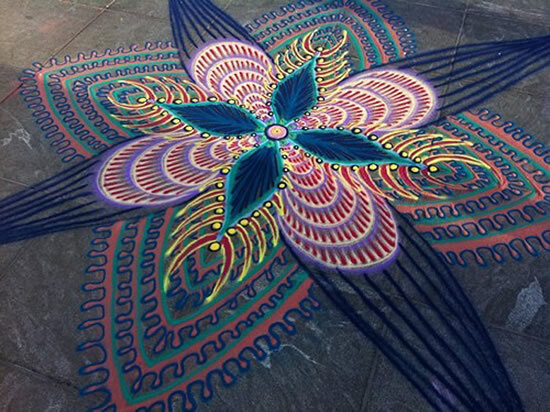 He has also had the chance to create his sand art on the floors of art galleries and museums.